Looking towards the Cole/Owen divide from the little cave on the back of a rock that I know by the name of Rumdoodle. vagrom wrote: Budawangs/Morton NP. Looking towards The Castle climb? ribuck wrote: Looking towards the Cole/Owen divide from the little cave on the back of a rock that I know by the name of Rumdoodle. I know the spot but won't steal ribucks thunder. But... I'm intrigued as to where that cave is - haven't come accross it?? Walk_fat boy_walk wrote: I know the spot but won't steal ribucks thunder. But... I'm intrigued as to where that cave is - haven't come accross it?? Firstly, fat boy, you should claim the prize because my guess was wrong but you recognised the spot. I assumed the photo was taken from the cave on the back of Rumdoodle, a little monolith at the northern end of Monolith Valley. Here's a photo of the front of Rumdoodle, however I can't find a photo of the cave on the back. It's just a small cave with an uneven floor, not suitable for sleeping in. As for your photo, crollsurf, it's a lovely photo, nicely framed. The valley is Monolith Valley, and you are looking across to the Seven Gods Pinnacles. Mt Cole is on the left. From your description, I'm assuming you were above the Nibelung Pass chains, but not far from them. This puts your cave on the side of Mt Mooryan, and I'll look out for it next time I'm in the area. Couldn't have described it better myself ribuck so your go. Pretty sure fat boy doesn't want to cut your grass plus he didn't actually say where it was anyway. Last edited by ribuck on Mon 11 Feb, 2019 10:00 am, edited 1 time in total. on the great north walk above cowan creek maybe? It's well south of the Great North Walk, jonnosan. I'm going to take a WAG that it is still in the Budawangs somewhere - climbing The Castle? You're correct, johnw, it's still in the Budawangs somewhere. But not The Castle. Keep walking, it's not Watsons Pass. Here's another clue: this next photo was taken from the same spot. You've got it! Natural Arch in Monolith Valley. 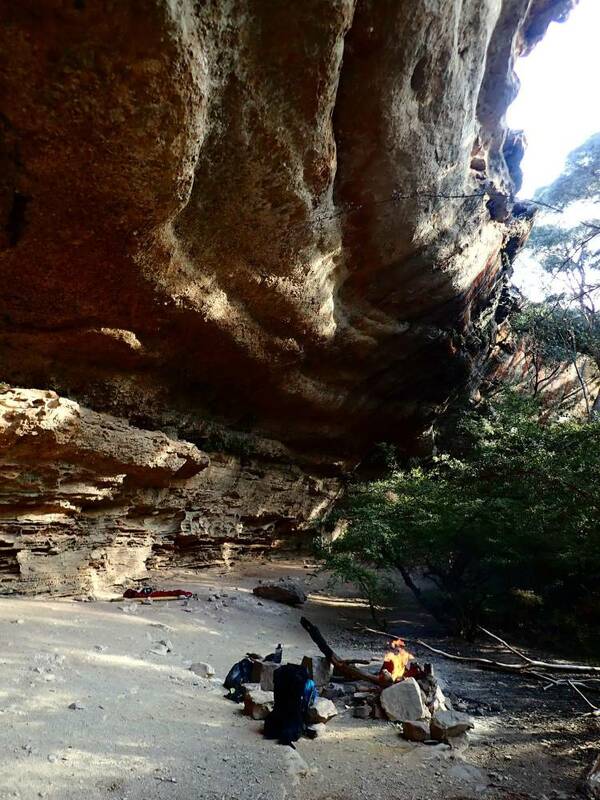 OK where in nsw is this awesome spot? jonnosan wrote: 1000 man cave (Kanangra)? Cool. I've not been to either spot yet (although I once failed to find 100 man cave). I hope to rectify that over Easter. I dont have access to photos just now so anyone can jump in. I am having trouble working out where you were when you took it though. Maybe around Twynam creek? Zapruda wrote: Looking toward Mt Tate? Spot on. looking at Mt Tate, near where Twynam creek joins the snowy river. From this weekend and about 10 mins before the temp dropped and the wind was bringing in rain sideways. Brrrrr. NSW.